Advantage: Save 90% manpower, and the quality is 2 times higher. If you can't download it, Please EMAIL US. Simply separate the 2D image into multiple background-erased layers with Photoshop, save it as a PSD (Photoshop) file and load it in PSD 3D Maker, and then all those slicing and merging process will be done as . 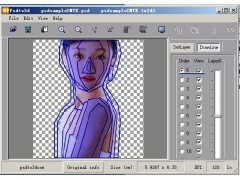 can add Flip-flop animation on 3d image. Lenticular technology allows you to stand out from your competitors and make the best use of your printing equipment. Our solution comes with everything necessary in order to create striking images with movement and 3D effect. Produce visual applications that are more appealing due to their surprising motion, animation, depth and 3D effects. Differentiate yourself from competitors with a new technology that will make your printing jobs more attractive. Give your current equipment an additional use.